Female Downy Woodpecker. Donna Dewhurst, Photographer. USFWS Digital Library. The Downy Woodpecker is the smallest woodpecker in the United States. While the Nuttall's Woodpecker is a California bird rarely found anywhere else, the Downy Woodpecker is a North American bird found in every state in North America including Alaska. 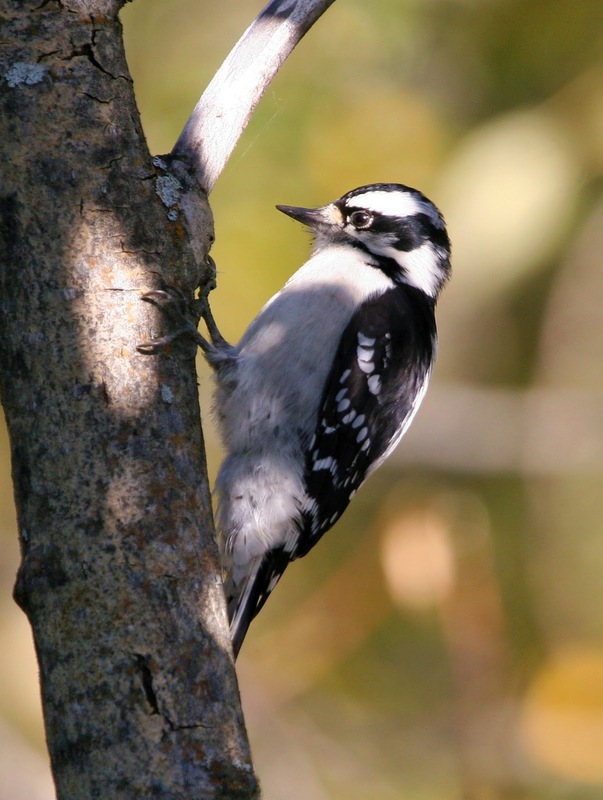 The Downy is also found in Canada, but not in Central or South America like the similar Hairy Woodpecker. Like many woodpeckers the Downy Woodpecker is black, white, and the male has red on his head. 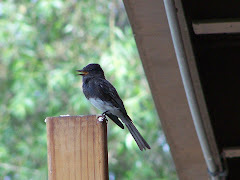 Both males and females have a large patch of white feathers on their backs. Male Downy Woodpecker looking mighty fluffy. The white feathers on the back of the Downy are soft and fluffy looking, hence the name "Downy" Woodpecker. The Downy Woodpecker is dainty. Its bill looks little and cute. Nothing like the big drill bit bill on the Hairy Woodpecker or most other woodpeckers. Remember, it is the smallest North American woodpecker, and so think little and cute. Downy Woodpeckers like deciduous trees no matter where they are. You will see them in forests, woodlands, parks, and even in apartment complexes with deciduous trees. Years ago I saw an adult Downy Woodpecker and her three babies on the trunk of a sycamore tree in front of my apartment. Caught me totally by surprise because I usually wouldn't think of an apartment complex as a woodpecker magnet, but it was. But regardless of where the trees are, most of the Downy Woodpeckers I have seen are in trees like sycamores, oaks, or even eucalyptus rather than pines. Males and females tend to forage in slightly different types of trees or locations on trees that vary across its range so that where the male and female Downy Woodpeckers forage may be different in California and New Jersey. However, the male will still take the better foraging areas no matter where in the country you see him. 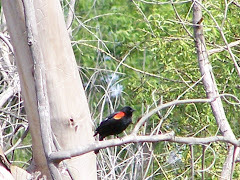 The male is the dominant woodpecker. Male Downy Woodpecker foraging among the bark and leaf litter on a eucalyptus. 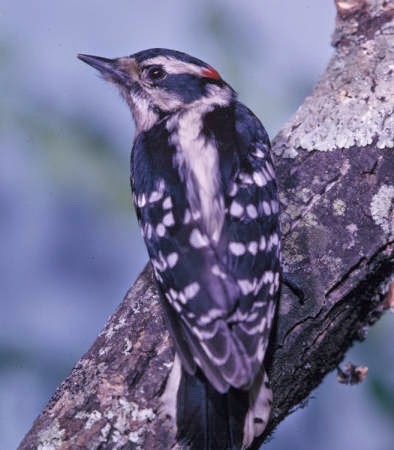 Downy Woodpeckers' diet consists of fruit, plant matter, sap, and also most of the creepy little edibles you might imagine on and under the bark and on the leaves of trees: insects, spiders, snails, caterpillars, larvae, and more. Downy Woodpeckers also drill holes in galls, and eat whatever they find in the gall including eat insects, and larvae. Like all woodpeckers, Downy Woodpeckers have zygodactyl feet which means they have two toes pointing forward and two pointing backward. Like all woodpeckers, they are able to use their zygodactyl feet to hold onto the tree more firmly and their to use their stiff tail feathers to help them balance and to move more rapidly by providing more stability as they move their feet. Sometimes woodpeckers move in a circular fashion up a tree, and they fly frequently to other locations. Female Downy Woodpecker excavating a nesting cavity. Downy woodpeckers nest in cavities they excavate in trees. Above is a female Downy excavating a cavity near the library at Huntington Central Park. She abandoned it soon after without finishing it, but the wood chips were flying for a while. 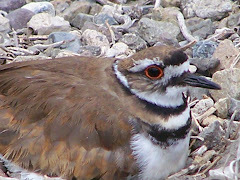 Males and females both excavate the nest and care for the young. Notice that there are black spots on the edge of her white tail. The Downy has black spots in the white edges of the tail, but the Hairy Woodpecker does not. The Hairy Woodpecker has pure white edges on its tail. The sound of the Downy Woodpecker is distinct. Try to listen to some of the drumming and calls of the Downy Woodpecker at The Macaulay Library. Get familiar with it. Knowing the sound can help you look for it and find it. Notice the small bill and dainty look of the Downy Woodpecker. Notice, too, in the pictures of the Downy the sharp angle of the bill. Notice the small bill on this Male Downy woodpecker. Downy Woodpecker and the Hairy Woodpecker are very similar. The Downy is common in Orange County, but the Hairy Woodpecker is rare. However, the very similar Hairy Woodpecker is seen on occasion in Orange County. Notice the spots on the white edges of the tail in the photo above. This is a Downy. Female Hairy Woodpecker, Donna Dewhurst Photographer. Courtesy USFWS. Well, the most obvious is the size. The Hairy Woodpecker is approximately 9 inches long and the Downy is only 6.5 inches long. Also, notice that the Hairy Woodpecker in the picture above has a much larger bill and lacks the dainty look of the Downy. In addition, the Hairy Woodpecker's feathers lack the soft, fluffy look of the Downy Woodpecker. The feathers look more hairy than soft and fluffy. Also as mentioned above, the white tail edges of the Downy are white with black spots, and the Hairy's tail edge are white with no spots. But the best thing is to view a lot of pictures, watch a lot of videos, and listen to a lot of audio recordings. The more you have seen and heard both the species, the easier it is to identify them. Notice, too, that the Hairy Woodpecker's bill is about the depth of its head. A big bill, not a dainty one. Female Downy Woodpecker. Very fluffy, and very dainty. Become very familiar with the profile and the look of each. 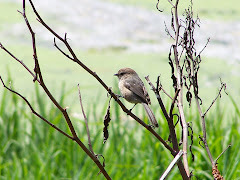 There is a distinctly different feel you get from a small dainty, fluffy Downy with a little, chisel-like bill and a larger Hairy with a large bill. The bill is bulkier on the Hairy and the slope of the bill from base to tip is much more gradual. 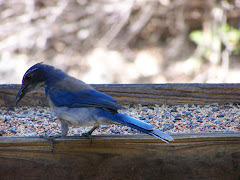 The Downy has a more sharp angle and a much thinner, pointed bill. It would take several bills to equal the depth of its head. The Hairy's bill is longer and thicker. It has a more gradual slope. And yes the bill of a Hairy is almost as deep as its head while the Downy covers only a about a third of the head, but get the feel for each bird. Familiarize yourself with the calls. It is like knowing twins who look very much alike, but have differences that are subtle. I used to work with several sets of identical twins, and there are subtle differences when you know them well. Initially, I couldn't tell who was who, but later I just knew. Get to know these well and you won't have much hesitation in differentiating them. 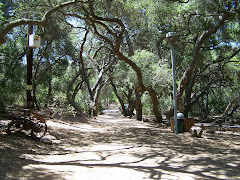 Enjoy the parks and wilderness areas and have fun as you look for the Downy Woodpecker and other amazing birds in Orange County. I highly recommend the Backyard Birding YouTube Channel. There are excellent videos and quite a few on Downy Woodpeckers. Has some good clips of the calls and rattles as well. View a lot of Downy Woodpecker videos. Helpful article on how to differentiate the Downy Woodpecker and the Hairy Woodpecker from Cornell Lab's Project Feeder Watch. An audio description of the Downy Woodpecker complete with its call. Transcript available. Video available, too. Video and photos of Downy Woodpeckers. New field mark detail discussed on Sibley Guides. 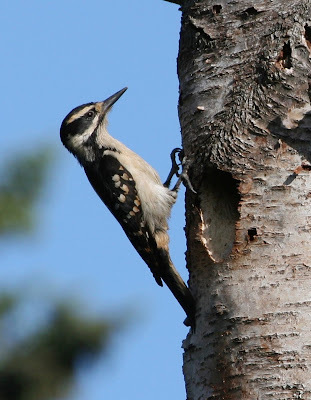 Detailed article with photos of the difference between the Downy and Hairy Woodpeckers.